What do those "Speed Ratings" on other cables mean? What does HDMI Certification mean? HDMI is a digital video/audio signal format which, since its introduction just a few years ago, has taken the home theater world by storm. An HDMI cable consists primarily of a set of shielded twisted pairs which carry video data, together with embedded audio, at extremely high bitrates. While analogue component video is, in practice, every bit as good a method of delivering video to displays as HDMI, the content-providing industries have strongly supported HDMI because it provides a platform for the implementation of HDCP (High Definition Content Protection) to prevent consumers from having complete access to the contents of high-definition digital recordings. As one might expect from a standard that was developed more to serve the content providers than to aid the consumer, HDMI has presented a few problems. Unlike analogue component video, the signal is not robust over distance because it was designed to run balanced when it should have been run unbalanced (SDI, the commercial digital video standard, can be run hundreds of feet over a single coax without any performance issues); the HDMI cable is an unnecessarily-complicated rat's-nest arrangement involving nineteen conductors; switches, repeaters and distribution amplifiers, by virtue of this complicated scheme, are made unnecessarily complicated and troublesome; and the HDMI plug is prone to falling out of the jack with the slightest tug. On the plus side, in the great majority of simple installations, HDMI works trouble-free, and its "one-cable" approach to home theater interconnection has simplified the process of setting up most equipment racks. HDMI is a fragile interface, not least because of the difficulties of manufacturing twisted-pair HDMI cable to the fine tolerances required to handle the extraordinary bandwidth requirements of the HDMI signal. To overcome those difficulties, we sought the help of Belden, the world's technology leader in communications cable products, and we asked Belden to use its patented, exclusive Bonded-Pair technology to build us an HDMI cable with extraordinary impedance stability and low skew. The result is a pair of products: the BJC Series-1 23.5 AWG HDMI Cable, and the BJC Series-F2 (and its updated version, Series-FE) 28 AWG HDMI Cable. These are the only HDMI cables on the market incorporating bonded-pair technology; they are also the only HDMI cable stocks made here in the United States -- in Monticello, Kentucky and Richmond, Indiana. 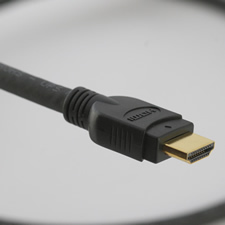 While economic and practical constraints have required us to have connectorization and final assembly done in China, both the Series-1 HDMI cable and the Series-F2/FE HDMI cable are, on a cost basis, well over 50% average U.S.-manufactured content, unlike our competitors' HDMI cables, which (despite, in some cases, careful attempts to avoid the point) are manufactured entirely in China from start to finish. Both versions of this HDMI cable are compatible with all versions of the HDMI specification, as further detailed below. If you're interested in the question of HDMI 1.4 compliance, see our article on this subject. For short runs, our recommended cable is the BJC Series-F2 HDMI cable or its new with-Ethernet version, the Series-FE. If you've read much about HDMI cable online, you know that most manufacturers use wire gage as their primary indicator of quality, because in the absence of any other measure of cable quality, people tend to assume that larger-gage cable will perform better than smaller-gage cable. This is clearly true for power applications like speaker cable; it's really not as meaningful for high-speed data applications like HDMI, where signal integrity is more important than mere signal amplitude. The Series-F2 and FE bring Belden's bonded-pair technology, with its low skew and tight impedance control, to small-gage cable and significantly outperform conventional twisted-pair designs. These cables, though made in 28 AWG and therefore quite thin and flexible, are certified under Category 2 ("high-speed") to 15 feet, considerably longer than any other 28 AWG HDMI cable. 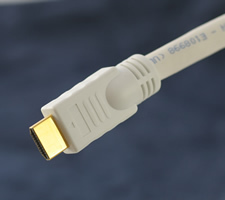 While a larger HDMI cable of the same design (our Series-1, below) will outperform it in distance runs, when extreme distance is not required the Series-F2 or FE will provide identical performance to the much heavier, stiffer, larger-gage HDMI cable, without the difficulty of bending and fitting that the larger HDMI cable can present. The Series-F2 and FE are rated CM for in-wall installation (higher than the typical CL2 or CL3). View our full spec sheet for this product. Click for our "Design Notes" article on this cable. Where performance over distance is required, our best cable is our original Belden Series-1, a 23.5 AWG cable. The Series-1 is quite thick and stiff, which is a drawback in terms of installation convenience, but performs better over distance than anything else we have seen--and this is borne out by its independent HDMI certifications. It is certified to the longest distances of any HDMI cable we know of--45 feet for Category 1 ("Standard" speed), 25 feet for Category 2 ("High speed". In actual usage, it ordinarily will work at distances far exceeding these--we have run 1080p video through a 125 foot cable without any information loss, but results will vary depending on the capabilities of the sending and receiving circuits of the devices in use. Like the Series-F2, this cable uses Belden's patented bonded-pair technology and the cable stock is manufactured at Belden facilities in Kentucky and Indiana; foot for foot, it is almost certainly the costliest HDMI cable stock in the world to manufacture, but we sell it at a price lower than many "premium" brands that lack the specs and the certifications that this cable holds.Read more details, or view specs, on our BJC Series-1 Bonded-Pair HDMI Cable. Before we offered the Belden cables above, our primary HDMI cable offering was the BJC Series-2, a more economical, Chinese-made cable, which is of excellent quality and very dependable. They are rated CL2 for in-wall installation, and use 24 AWG silver-plated copper signal conductors.View the drawing and spec sheet on our Series-2 HDMI and HDMI/DVI Cables, in .pdf format. Sometimes, the best value for the money is the best product you can find; but sometimes, it's the least expensive product you can find. For those more inclined to the latter than the former, we offer Tartan brand HDMI cables. These come in three types: tin-plated-copper 24 and 22 AWG, CL2 rated cables, and high-flex, tin-plated-copper 28 AWG cables (not CL2). The cable stocks used in these products come from Copartner and LTK, both of which are leading Chinese manufacturer of HDMI cable (and the latter of which is a Belden subsidiary). Tartan HDMI cables are listed below; if you'd like more information on the Tartan line, see our Tartan HDMI Cables page. Most of the cables listed above are available in DVI/HDMI configuration as well as the standard HDMI/HDMI configuration. We have moved those cables to a new DVI to HDMI department on this site. As with all of our products, we offer a simple and easy return policy. If for any reason you're not completely satisfied, just return the cables, undamaged, within 30 days and we'll refund your purchase price in full. New "with Ethernet" version of our 28 AWG High-Flex Bonded Pair design; our favourite for runs up to 25 feet. Our best cable for distance runs. NOTE: has US-style power plug.